I know, green beans are, well, green beans. Pretty straight to the point, right?! Greens beans are a humble vegetable that, when served as a side, are pretty easy to make. So claiming that something so incredibly simple is “the best” may raise some eyebrows. So how about a little backstory? 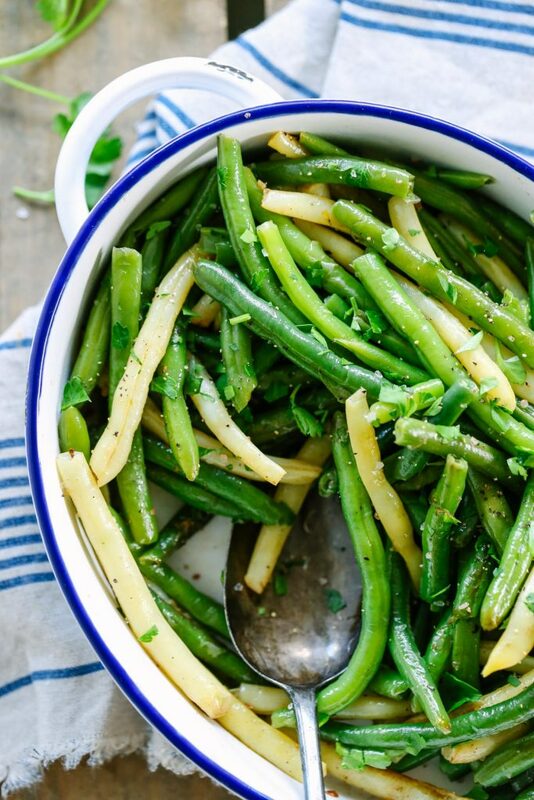 For years, I made green beans the exact same way every single week: boiled. 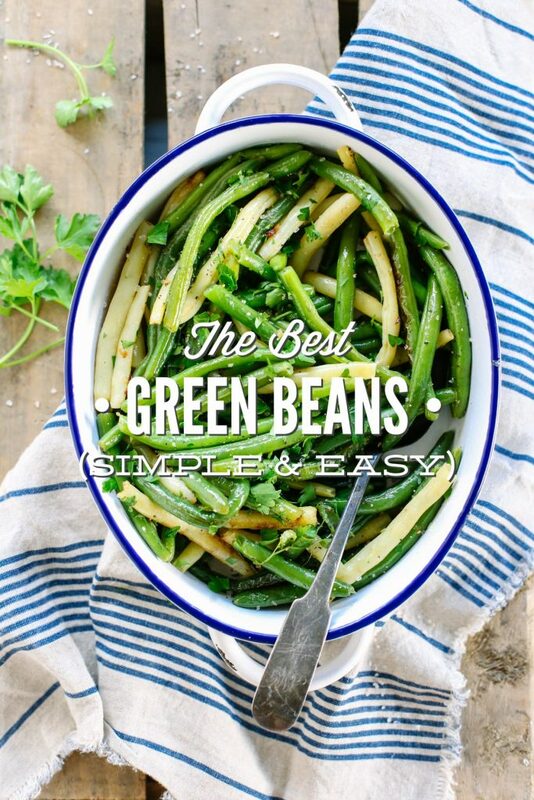 Yes, green beans are pretty tasty even when they’re boiled (and yes, I realize the nutrients are lost when boiling vegetables), but I certainly wouldn’t ever use the phrase “the best” to describe them. I think edible and tolerable are probably more appropriate. One day, for some out-of-routine reason, I decided to take a different approach to preparing green beans. Instead of boiling, I steamed the beans. Instead of serving the beans dripping with water, I removed the beans from the steamer and sautéed them with butter and garlic. Divine perfection! 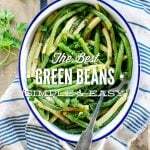 Something so humble and simple quickly became the best green beans ever! I believe it’s easy as a blogger and “foodie” to get caught up in the fancy meals spread across Pinterest, Instagram, and magazines. And while I love reading about the special ingredients and techniques used to make these meals, most of the time they simply aren’t practical for our family (or the family budget). For most of our meals, I resort to simple recipes with great flavor that can be prepped using simple and classic techniques (for example: sautéing and roasting). This means weeknights usually consist of a simple meat or meatless main dish: roasted chicken, crispy chicken thighs, soup, lentils, black beans and rice (my favorite), eggs (frittata or quiche), hamburgers (beef or salmon), salmon (or another fish) in parchment with lemon slices and a drizzle of olive oil, a crock-pot roast, a veggie stir-fry or a bowl meal, homemade pizza, tacos, etc. I tend to focus my effort on the main meal, which means a side dish is either prepped in advance or must be easy to make on the spot. A few of my favorite side dishes include: homemade freezer biscuits (with soup), coleslaw (for taco night), roasted potatoes, an easy weeknight salad, a medley of roasted seasonal veggies, and the BEST green beans. I’ve shared many of these sides on the blog. Today, it’s finally time to give The Best Green Beans their overdue spotlight. Shall we proceed? The Best Green Beans only take about 15 minutes to make, and 9 minutes are technically hands-off time. Green beans are a great vegetable for the kids to help prep, so I usually set them up with snapping the ends of the beans, which saves me even more time. Once the ends are snapped, the beans are added to a steamer basket and softened for about 7-9 minutes. Once the beans are soft, the beans are added to a skillet with melted butter, sautéed garlic, and fresh herbs. This, my friend, is where “the best” part comes into play. This extra sauté step adds AMAZING flavor and a slightly crisp texture to the steamed beans. The final result is a simple side that’s devoured by every single family member, every single time it’s made. Who needs complicated meals when simplicity tastes sooooo good? 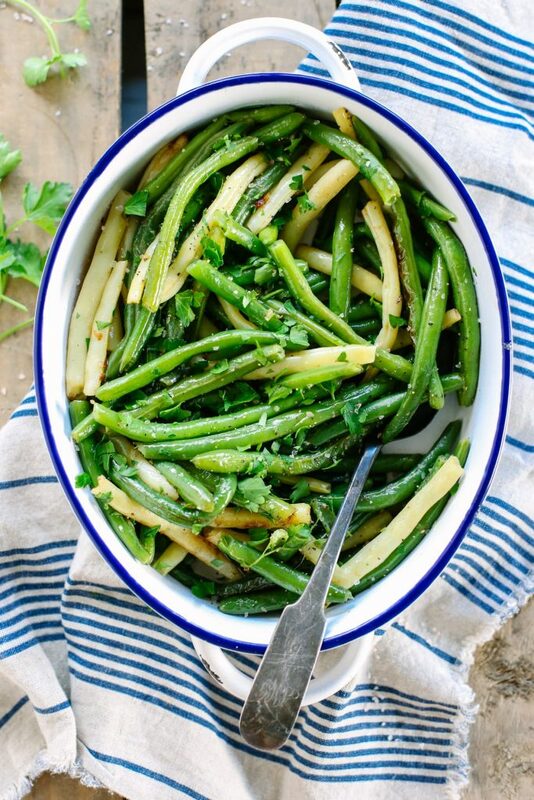 Green beans that are THE best. Steam the green beans for 7-9 minutes, just until soft. To accomplish this step, you have three options: 1/ Add the green beans to a steamer pot/basket (I have a pot like this, or use a steamer basket). 2/Fill a pot with about 2 cups of water, bring the water to a boil, add the green beans, and then cover the pot with a lid. The green beans will not be submerged in the water, so the steam will do the work. 3/ Fill the bottom of a pot with water, and bring the water to a boil. 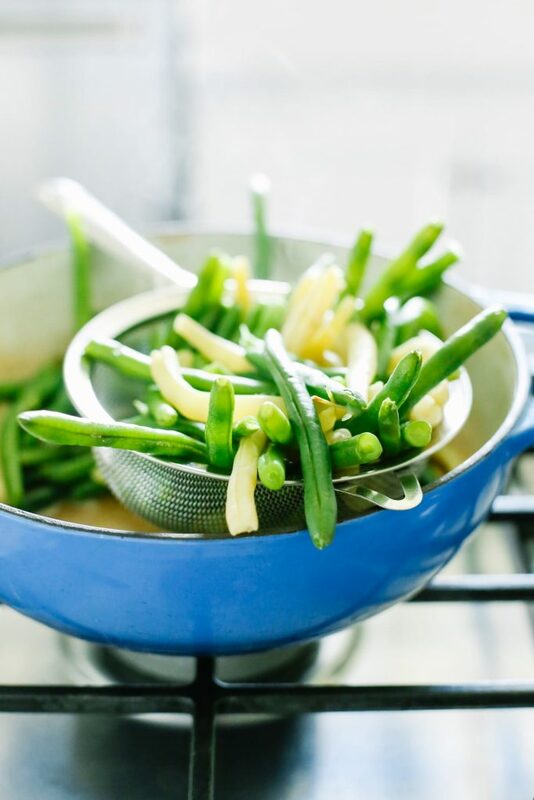 Place a large colander over the water, then place the green beans inside, and cover the pot with a lid. Once the green beans are soft, melt the butter in a skillet over medium heat. Once melted, add the minced garlic and transfer the beans to the hot skillet. The garlic will become fragrant thanks to the heat and can easily burn, so work quickly. I use tongs to do this. I also gently shake off any excess water before adding the beans to the skillet. Sauté the green beans in the butter and garlic for about 2 minutes, then add the fresh herbs and salt and pepper to taste. Garlic Step Note: If you’re afraid of the garlic burning due to the amount of time it may take to transfer your beans to the skillet, then wait to add the garlic until all the beans are in the skillet. 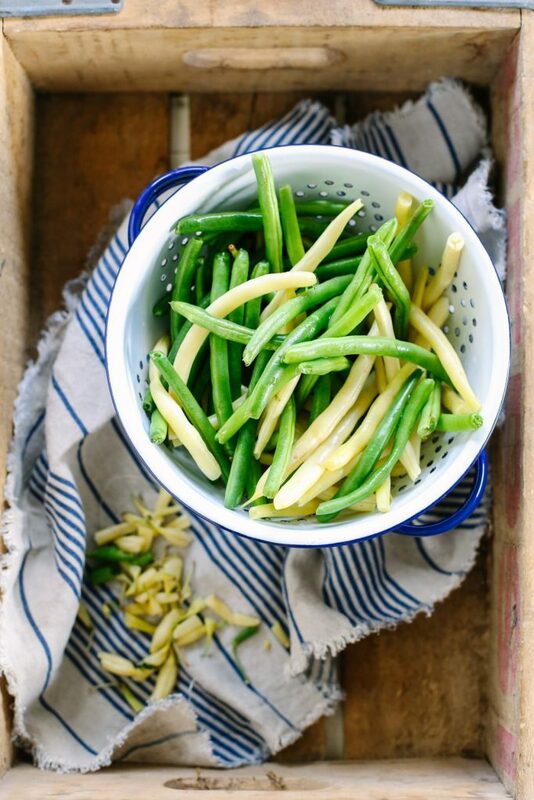 The goal is wonderfully fragrant, sautéed garlic and green beans. This recipe sounds just wonderful! I have steamed or sauteed green beans, but I never thought to do both. It is amazing how tasty veggie sides are, when you give them a little love & effort. 🙂 I have some organic frozen green beans from Costco, which are crazy crispy (almost like fresh), so I can try this recipe, this week! Hey Rachel, So true! 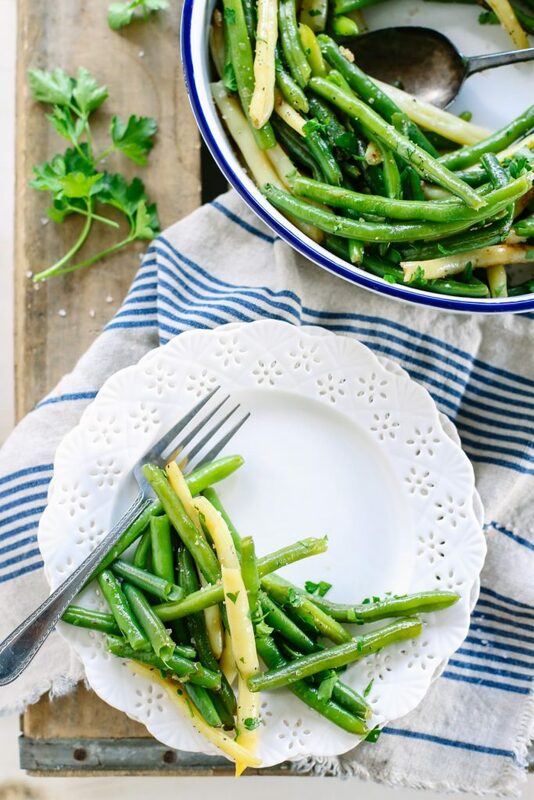 I use the organic frozen green beans from Costco regularly for this recipe (yay for Costco!). They always turn out sooo good! This is how I make my green beans, but I usually sauté them in a little olive oil and reserved bacon grease because we have some dairy free family members. I like to add a squeeze of lemon for brightness and a sprinkle of Parmesan when we’re feeling fancy. They are so good. You’ve inspired me to buy a bunch next time I’m at the store! Yum, Anne! That sounds amazing!! This sounds really yummy. Silly question but does steaming add another dimension of taste that just sautéing won’t? I’m just curious about just sautéing them (which is what we usually do). Thanks! Hey Christie, I’ve found that steaming them really helps with the overall texture of the beans–they’re nice and soft all the way through, and then sauteing crisps up the outside just a bit.